SAGITA COM - sagita-com.tk - H264 WebCam Deluxe v3.92 adalah software untuk menghubungkan webcam agar gambar dari webcam tersebut bisa tampil di monitor. Terkadang laptop bawaan dari pabrik tidak di sertai dengan software seperti ini, H264 WebCam Deluxe ini juga bisa merekam video kedalam berbagai format seperti avi, mp4, mkv, dll. Video Encode H264, H263, H261, XVID, MPEG4, MPEG2, MPEG1, FLV, WMV3, MSMPEG4 etc. Record File Format MP4, MOV, AVI, FLV, SWF, ASF, WMV etc. Supporting manual record, scheduled record and video motion record. Record File Position The directory : TimHO_Rec, in each disk partitions, support U-Disk and Net Driver. 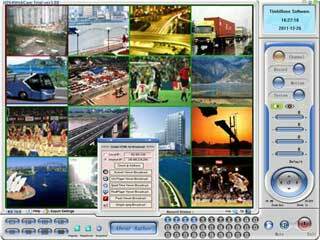 Network IP Camera support more than 70 kinds of network cameras. View the supported IP camera List. PTZ control Support Pan Tilt Zoom and preset control many network cameras. Network Server Function Broadcasting live audio and video on internet, help you to create web page and Streaming video and audio to h264, aac, asf multimedia stream, and it can be viewed by Quicktime, Realplayer, Windows Media Player, Flash player, IE or Firefox browser on remote PC, Macintosh, Mobile Phones etc,H264 User Name mode, don't need to know remote ip address. Supporting dyndns.org, changeip.org, dynddns.us dynamic domain service.